Damaged by the storm, the city closed the road for repair. A foil-wrapped behemoth, you need two hands to eat this burrito. When we have a participle like “damaged,” we naturally understand it as modifying the closest noun, which here yields a mismatch. Was the city damaged or the road? The most common cause of head pain is ice cream, occurring in one third of a randomly selected population. Earlier this year, after serving more than 35 years in prison, President Barack Obama commuted [Oscar] Lopez Rivera’s sentence. Coming out the barn, Sara saw her father. From Washington, you’re listening to NPR. No one is likely to be confused about where they are when they are listening to National Public Radio. As a director and a citizen of the world, the search for these answers is what drives my artistic work. As innovators go, Malamud’s life was interior and modest. When reading Mary Kathryn Nagle’s Manhatta, my gut did a backflip. Contrary to conventional wisdom, history doesn’t repeat itself. I would change some of these and leave others alone. It’s very much a stylistic judgement call. In the first sentence, the phrase “As a director and a citizen of the world” has the potential for misreading, but the later reference to “my artistic work” makes the point clear. It looks okay to me. In the second sentence, the phrase “As innovators go” seems to modify “Malamud’s life,” so that sentence might be revised, but it’s hard to rephrase in a way that is as concise. The best I could do was “As the lives of innovators go, Malamud’s was interior and modest,” which lacks the pace and punch of the original. I would probably change the third example: “When reading Mary Kathryn Nagle’s Manhatta, my gut did a backflip.” Here it’s possible to momentarily conjure up the image of a gut reading a play. For me, “When I read Mary Kathryn Nagle’s Manhatta, my gut did a backflip” works better. And in the last example, there is nothing to change. “Contrary to conventional wisdom” is a sentence modifier, and no one is likely to misread it as ascribing contrariness to history. When we look at such sentences, some writerly risk factors stand out: possessives (like “Malamud’s life,” or “my gut”), subjectless participles (like “When reading”), and scene-setting nouns (like “As an innovator”) can all be tricky. The more of these grammatical constructions that co-occur in a sentence, the more likely it is for something to go wrong. On the other hand, phrases that modify a whole sentence (like “From Washington” or “Contrary to conventional wisdom”) are unlikely to cause problems. If you keep an eye on these factors, most of your modifiers will fall into place. Featured image credit: books by Stiller Beobachter. CC BY-SA 2.0 via Flickr. Edwin L. Battistella teaches linguistics and writing at Southern Oregon University in Ashland, where he has served as a dean and as interim provost. 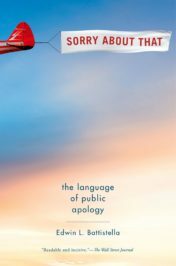 He is the author of Sorry About That: The Language of Public Apology (OUP, 2016), Do You Make These Mistakes in English? (OUP, 2009), and Bad Language (OUP, 2005). I never understand this complaint. It seems to be a very America thing. I have to work really hard to find the ambiguity you in these examples.